In Part 1 (this article) I will cover off the things that have changed over the past 10 minor versions and how they may affect you. Also I will cover off what steps are required for a Windows client to be setup and function correctly in an enterprise. Part 2 here I will cover the method I have used to deploy Java to our Windows 7 clients, including the technical details for you to be able to do it yourself. I must warn you all, the following article series will be long so I ask you to read carefully, as well all the reference articles if anything is unclear. As usual I’m always happy to follow up with queries if anyone is uncertain. *Note we have not performed extensive testing for all scenarios of this approach and would love to hear if any of it could be improved. My script is a humble batch file, and as such is not the most sophisticated – improvements are welcome. Lastly there are many ways to achieve a final goal, this is but one way that I chose to use. What has changed recently with Java 7? Ever since Oracle has taken action to actively resolve the security problems within Java they have made some substantial changes to the core of the Java Runtime Engine especially how it deals with being outdated. In detail you can review the release notes here (http://www.oracle.com/technetwork/java/javase/7u-relnotes-515228.html). Since JRE 6 has reached its End of Public Updates Oracle is taking steps to protect consumer desktops. We will not leave a version of Java installed for which we no longer provide security updates .In order to do so, when updating from JRE 6, the update mechanism will not only install the latest version of JRE 7 but will also remove the highest version of JRE 6 on the system. This change will happen when the system is updated via the auto-update mechanism or by checking for updates directly from the Java Control Panel. Users who need to keep a version of JRE 6 in their systems can do so by manually installing the latest version of JRE 7 rather than relying on auto-update or updates through the Java Control Panel. If JRE 6 has already been removed from a system, but the user would like to restore it, earlier versions of Java can be accessed from the Java Archive. Note that Oracle strongly recommends leaving only up-to-date versions of the JRE on desktops. Retaining an older version of the JRE in your systems should only be done by expert users or enterprise administrators with a need for those earlier versions and an understanding of the associated risks. In this release, low and custom settings are removed from the Java Control Panel(JCP)’s Security Slider. 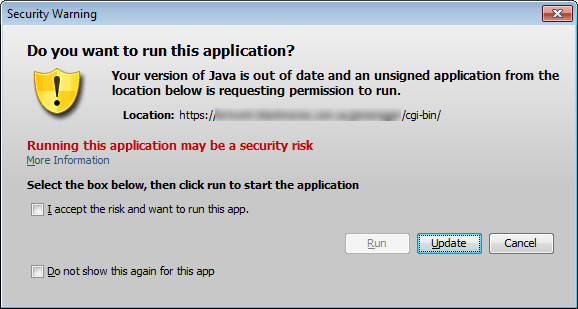 Depending on the security level set in the Java Control Panel and the user’s version of the JRE, self-signed or unsigned applications might not be allowed to run. The default setting of High permits all but local applets to run on a secure JRE. If the user is running an insecure JRE, only applications that are signed with a certificate issued by a recognized certificate authority are allowed to run. he signed JAR files are not tagged with the Trusted-Library attribute. Starting from JDK 7u21, it is recommended that all applications be signed. In addition, it is also possible to restrict signed applications to the security sandbox.Therefore, the previous use of the term "unsigned" to mean an application that ran in the security sandbox and "signed" to mean an application that ran with extended permissions, is no longer meaningful. The terminology in the Java Tutorial and the Java SE Guides has been changed to use “sandbox application” for applications that are restricted to the security sandbox, and “privileged application” for applications that have extended permissions.Unsigned or self-signed applications may not be supported in future JDK update releases. Synopsis: Aborting the update after clicking “Update” on the “Java is insecure” warning message forwards all applets to java.com/download. When an older JRE is installed on the system, launching a web page with an applet prompts the user with “Java is insecure” message. If the user clicks on the “Update” button on the message but later aborts the update process, user is automatically redirected to http://java.com/download page. The expiration date for JRE 7u45 is 02/14/2014. After this date, Java will provide additional warnings and reminders to users to update to the newer version. For more information, see JRE Expiration Date. A new button is available in the Java Control Panel (JCP) to clear previously remembered trust decisions. A trust decision occurs when the user has selected the Do not show this again option in a security prompt. To show prompts that were previously hidden, click Restore Security Prompts. When asked to confirm the selection, click Restore All. The next time an application is started, the security prompt for that application is shown. See Restore Security Prompts under the Security section of the Java Control Panel. So what do all these changes mean? From what I can see in the industry, it appears as though the owners of Java, Oracle, are making an effort to combat security issues by actively updating their software to better secure the client from vulnerabilities. They may not have provided adequate enterprise tools in parallel to the updates however I feel they have corrected critical issues\pain points within a reasonable time-frame. For an administrator it means there have been lots of good changes but did cause a bumpy ride for some. If you you were one of those eager security conscious admins who wanted to apply the latest Java versions, you may have got yourself into a pickle with version 25 due to additional security prompts that you might not have been aware would occur, and that were difficult to disable. These security prompts would become evident after a particular date, if it was not updated to the next version. NOTE: THIS ARTICLE IS NOT TO ASSIST YOU IN RUNNING JAVA 7 UPDATE 25 AND REMOVING SECURITY PROMPTS! Yes it is technically possible using various methods but is not supported by Oracle. Pressuring vendors to support J7U45 (or the latest Java updates sooner) may be easier than applying these workarounds. In our situation we were happy to use J7U45. Currently there are two workarounds with U45. One is to set your security to Medium – quite easy to do but not good security practice. The second is to create an XML whitelist that you digitally sign (using a valid 3rd party certificate) that gives permissions to run it like it was digitally signed. The solution is to request the developers to simply digitally sign their software so you dont have any problems. 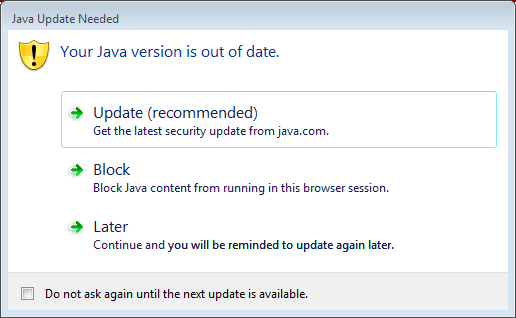 If you are not an Admin, but are prompted to upgrade Java, you may click on Update button. This causes the system to run a loop and no Java from working. Increased helpdesk calls from this problem occurred. To keep up to date, and not have your users prompted with most warning (note there are some that simply cant be avoided) you can try the solution we are using. The solution will be in the below order. Note the items in GREEN are optional and not required. Perform installation of Java installation. Note both options below work, and its based on deployment preference. Hopefully this article has helped explain what Java has done over the last 11 months, and how you can now deploy the latest version of Java with confidence. If you enjoyed this, have a read of my next article that explains in detail how i execute the above steps in a real world scenario, including the scripts and processes that I have successfully used.